Challenge Optimum SA leads the quality management workshop back to back with the ABU 53rd General Assembly in Bali. 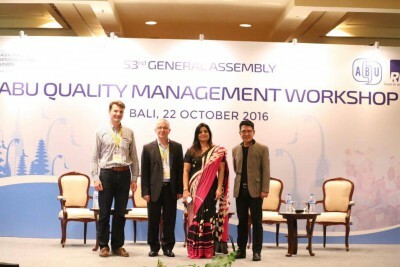 Over 40 executives, from all over the Asia-Pacific area and more specifically from Radio Republik Indonesia attended this one-day workshop to get acquainted with the ins and outs of quality system design and implementation. That was also a key moment to collect the feedback from Thai PBS which has just been certified according to ISAS BCP9001 by SGS and by Maharadja TV which is in the process of certifying its media production unit in Colombo. Ipséité, represented by François Blayo, also introduced new ways of managing efficiently media contents copyrights. ‹ Oct 2016 : Thai Public Broadcasting Service gets certified !